Mark your calendars! Don't you dare miss the "see and be seen" event of the year as COAST celebrates Christmas and the end of 2016 with good friends, good food and good cheer! 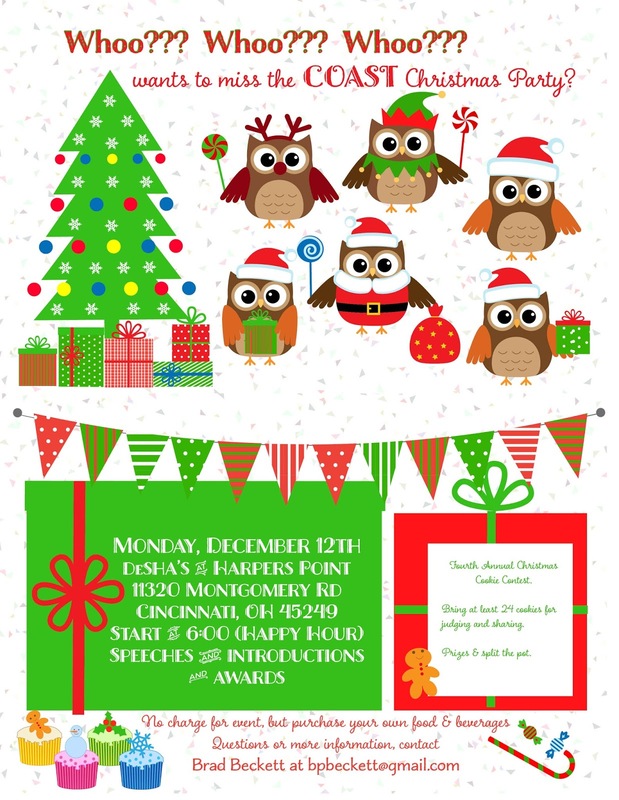 Monday, December 12th, 6-9pm, DeSha's Tavern at Harpers Point. Superintendent claims of outside group spreading misleading information - - NOT TRUE! 1) TRUE – COAST was correct this levy will be a continuing levy, as are all of Kings current levies, which will increase taxes $217 per $100,000 of home value. 2) TRUE – COAST was correct according to KINGS own documents, KINGS total revenues grew from $34.2M (2010) to $41.5M (2016). COAST defines flat funding as a 0% increase. Yet with the state funding and TPP (tangible personal property tax) reimbursement KINGS funding increased by 1%, not flat and they don’t talk about the reimbursement for the TPP, they only claim they lost money! The unreserved cash balances on June 30 listed are just projections beyond 2016. KING’S practice has been to paint the worst case scenario because of conservative revenue projections in the October 2016 forecast, current cash reserves won’t be depleted until 2019. Why does Kings need a levy now? 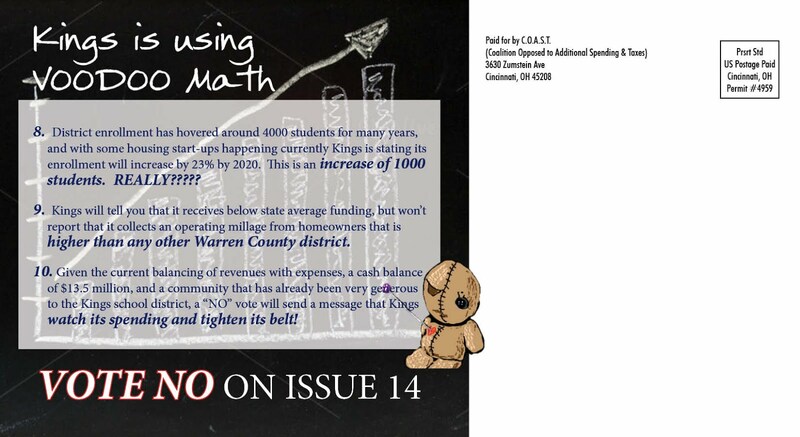 4) TRUE – COAST was correct according to the Ohio Department of Education current 2015 district profile Report, KINGS has more Administration expenditure per pupil than similar districts. KINGS recent actions don’t paint a picture of “Tightening the Belt”. KINGS recently made the Public Relations person full time and replaced the business manager, these positions have full administration benefits and salaries which includes 100% of their retirement paid by the taxpayers, which equals 24% of their salary and 95% of their healthcare costs. 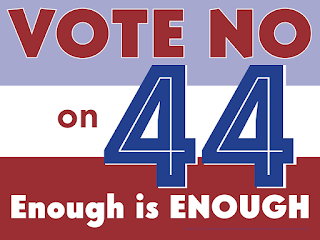 5) TRUE – KINGS voted against adopting the Ohio Checkbook without ever seeing a demonstration of the Nations #1 ranked transparency program and again denied a demonstration after a formal request from the Treasurer’s office. WHY? The OHIO checkbook program has set new transparency standards, which provide interactive tools to search and compare spending data and empowers taxpayers to follow the money. It’s a key to open government so KINGS claims of transparency don’t ring true. Board docs, while a good tool, it’s just a program to post documents. Why does KINGS refuse this transparency? The Ohio School Board Association, the Ohio Association of School Business officials, and the Buckeye Association of School Administrators have all endorsed the Ohio Checkbook.com. 6) TRUE – COAST questions, the concern for the abuse of special needs students, with district’s claims, this horrible ordeal only cost taxpayers $5,000. What about the $80,000 payout and glowing recommendation for the teacher involved?? What about the legal costs for the 9 depositions, and most importantly, where’s the district’s compassion and remorse for what happened to our most vulnerable children, those without a voice, who endured this treatment. We still don’t know who knew what and when. 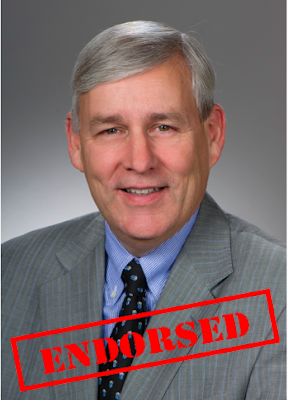 7) TRUE and SAD, again no concern or remorse for allowing an environment, where the former Board President stated, that he was threatened, intimidated and subject to harassing criticism. How sad, he had to ask for the school resource officer to attend meetings. 8) TRUE – current enrollment projections in KINGS for October 2016, 5 year forecast shows 2016 enrollment at 4,211 and growing to 4,506 by 2021, adding 295, these are the district’s numbers. The latest propaganda from The Kings Citizens for Quality Education get a 23% by 2020????? Where did this number come from? 9) TRUE – According to the Warren County Auditors school district Rates, KINGS current school taxes on $100,000 home value are the highest in Warren County. $1,348.65 School taxes on $100,000 home value. 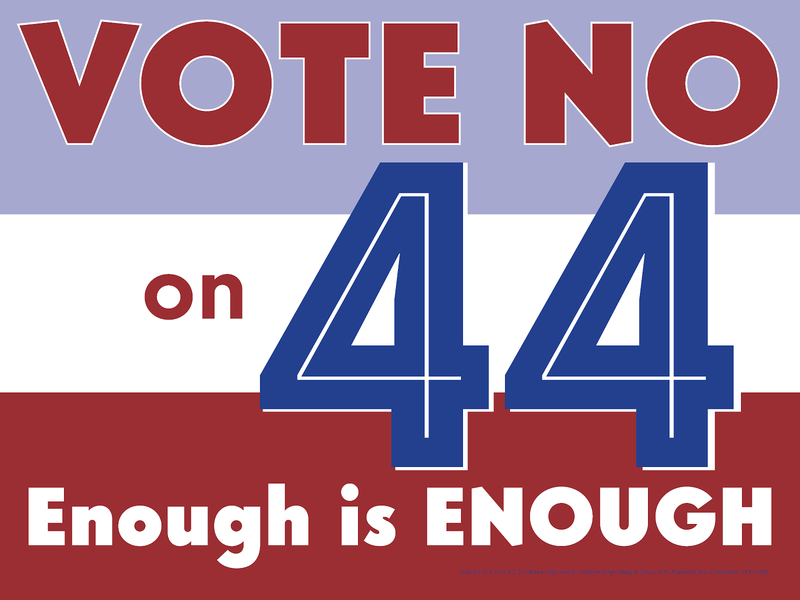 If the Levy passes the millage will go from 36.7 to 42.9, a 17% increase forever. The total taxes will be $231.81 higher than MASON. KINGS general operating millage will be 42.9 mills, 8.3 mills higher than MASON. 10) TO THE KINGS BOARD – What have you done to tighten your belt? When most districts understand, given the current economy, not having funding cuts is the most they can hope for, and work hard not only to control spending but wait as long as they can before raising taxes on families and Senior citizens. NOT KINGS! 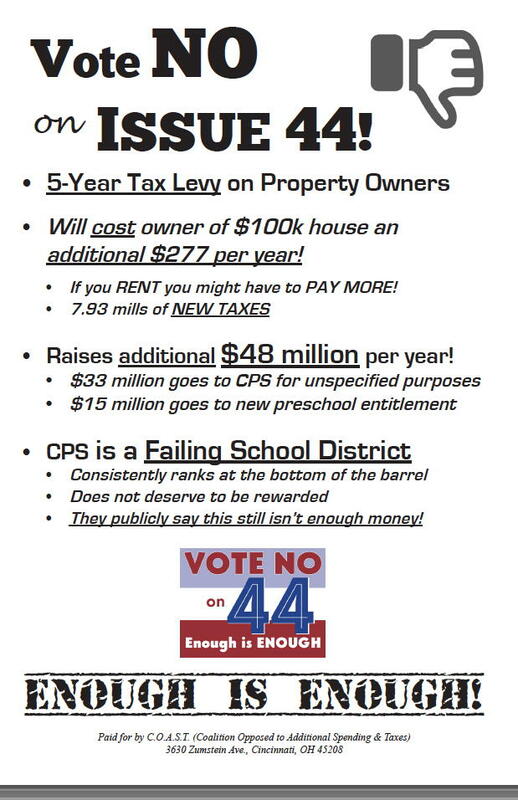 They went to levy with almost $8 Million in their checkbook in 2010 and here they go again!!! Only worried about the districts checkbook and forgetting about taxpayers, who are struggling! The district has continued to hire at the top while threatening to cut Teachers and Programs for students, while you are sitting on a cash surplus of +$9 Million. This is wrong!!! 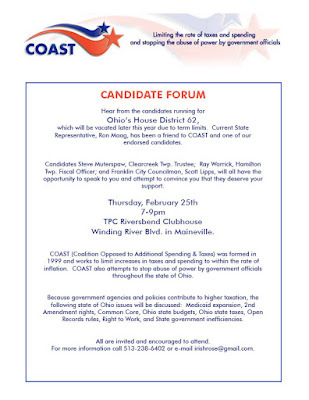 The following individuals and issues have been endorsed by COAST in next month's election. COAST urges you to remember these fine patriots & issue positions when you cast your ballot on November 8th! As expected, Cincinnati's City Council voted this week to use general fund revenues to pay for operation of the Streetcar Named Deception. Smitherman has been a fearless truth teller on the Streetcar and all matters fiscal throughout his tenure on Council. 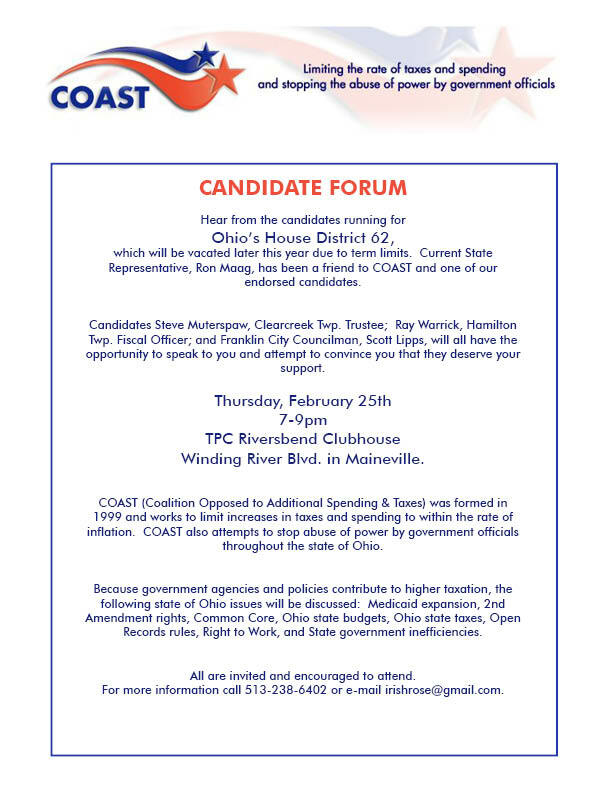 Please join COAST for the Ohio House District 62 Candidate Forum. Incumbent Ron Maag is term limited in this Warren County seat. Candidates Scott Lipps, Steve Muterspaw, and Ray Warrick will have the opportunity to convince you why they deserve your support. We look forward to seeing everyone!